All visitors have the same IP address and Provider. How do I track individual IPs? Matomo tracks far fewer visits than other web analytics tools, but tracks the same number of pageviews. Matomo doesn’t track any visits and pages, and shows “There is no data for this report” in all reports. Visits from search engines or campaigns are not recorded, Matomo shows “There is no data for this report” for all Referrers reports. Matomo doesn’t track Downloads and Outlinks on my website. Matomo doesn’t detect accurately the Country and/or Continent of my visitors. Matomo is slow! It takes a long time to load widgets, reports and pages. I get ‘Oops… there was a problem during the request.’ or ‘Internal Server Error’ or ‘500 error’ or the ‘White screen of death’. How do I proceed? Matomo does not track visits on SSL / HTTPS pages. After I updated Matomo, it stopped working (blank page, widgets not loading, error message, etc.). How can I fix this? How do I configure my server to let Matomo serve HTML files? The sparklines (small graphs) are not showing in my Matomo. How do I configure Matomo on a server without Internet? When tracking visits on an intranet website, Matomo assigns all page views to a few visitors who have very high page views count. How to fix it? How do I configure Matomo when mod_security (or CA SiteMinder) is enabled? Almost all reports and dates are working fine except one or a small number of days/weeks/months/date ranges which display zero visit. How do I fix this issue and restore the missing data? The numbers from Transitions don’t match other numbers shown in Matomo. Why? How do I check that my Matomo SSL Server is correctly configured? I would like to import an existing Users database (login, password, emails) in Matomo, but the usernames and passwords are more permissive than what Matomo allows. How do I disable the checks on the Logins & Passwords? Matomo doesn’t show me when new updates are available, and the SEO plugin doesn’t work. “Segmentation fault Error”. Matomo reporting or via cron crashes with Segmentation Fault error. What to do? I get the error message: “Fatal error: require_once() [function.require]: Failed opening required XYZ in /path/piwik/XYZ.php on line X”. How can I get Matomo to work? How do I solve issue ‘An error occurred: Cannot connect to the database’? I get the error “Warning: gzuncompress() [function.gzuncompress]: data error” when looking at my Matomo reports. Emails sent from Matomo use the email address @defaultHostnameIfEmpty.example.org, how do I specify my domain name instead? Matomo reports this error and fails: “Fatal error: Allowed memory size of X bytes exhausted (tried to allocate X bytes)”. What should I do? How do I fix the error “Mysql Server has gone away”? How do I fix the Mysql “Error while sending QUERY packet”? Graphs in PDF/HTML reports and/or Matomo Mobile do not display characters correctly in my language (display squares instead). When I use force_ssl=1, I get “Too many redirects”. Also when I use https, CSV/PDF reports and graphs don’t work. Why am I getting a warning about an untrusted hostname? When included in an IFrame, Matomo reports do not load. How do I allow Matomo reports to load from within an iframe? I get the error: Table matomo_log_x is marked as crashed and last (automatic?) repair failed. How do I reset the visualisations settings stored for a specific user, or for all users? How do I correctly track my very long Page URLs and Page Titles without truncating any characters? I’m a developer, how do I enable logging (and / or SQL profiling) in Matomo? I get the error message: “Fatal error: Class ‘not found in …”. What’s wrong? How do I disable the OPTIMIZE queries which take too long on my server? How do I get LOAD DATA INFILE to work on my server? How do I fix the error “General error: 3 Error writing file /tmp/xyz (Errcode: 28 – No space left on device)”? How do I fix the error ‘Fatal error: Maximum function nesting level of ‘100’ reached, aborting!’? How do I convert the MySQL database tables from MyIsam to InnoDB? How do I disable brute force authentication security checks for specific IP addresses? How do I report a bug in Matomo? If you are seeing that all your visitors are correctly tracked in Matomo (Piwik) but that they all have the same IP address, read on. In your ‘Visitor Log’ report, if all your visitors have the same IP address or the same Provider, this FAQ will provide a solution. Why do I see the same IP everywhere? In most cases this IP address (that is set to all visitors) is either the IP of the Matomo (Piwik) server itself or maybe the IP of a proxy server or a firewall between your website’s visitors and the server hosting your website. Sometimes the IP address will be set as 0.0.0.0. How do I fix this issue? 1. Your Matomo (Piwik) server may actually be hosted behind a proxy. To configure Matomo to track IP address correctly when using a Proxy server, read this FAQ to configure Matomo to read the correct IP address. As explained in this FAQ you may add lines in your Matomo config file to tell Matomo where to read the IP address. 2. Are you using the Tracking API? You may also experience this problem when you are using one of the Tracking API clients to record visits and actions. You may use the method setIP() to overwrite the IP address manually. See the reference. If you use other web analytics tools on your website, in some rare cases you may find that Matomo (Piwik) tracks far fewer visits than other tools. While there are explanations for small differences, sometimes Matomo (Piwik) will track fewer visits but about the same number of pageviews (actions). When this happens, it shows that the algorithm attributing Visits to particular pageviews is not working as expected. If your website visitors are visiting from one IP address (eg. they connect from the same offices), then Matomo (Piwik) may mistakenly believe all actions by this IP address are the same. In this case you can set a setting in the config file, make a change to your config file as explained in this FAQ. Make sure you are viewing reports for the correct website and date in Matomo (Piwik) In Matomo, make sure you selected the right website in the website selector. Also, try to look at reports for “today” by changing the date in the date picker. Please wait at least 10 seconds after generating visits on your website: by default Matomo will only process reports every 10 seconds when “today” is selected. In Administration > General Settings, ‘Allow Matomo (Piwik) archiving to trigger when reports are viewed from the browser’ must be set to ‘Yes’. If it is set to ‘No’, you must configure the cron script to automatically archive your web analytics reports, or Matomo will show ‘No Data’. More information about auto archiving. Third party Matomo (Piwik) plugins It is possible that some Third party Matomo plugins could cause problems when tracking your visitors. Please try to disable all the third party plugins you are using to see if it fixes the issue. Matomo (Piwik) by default supports DoNotTrack: please check you haven’t enabled DoNotTrack in your browser options. Do you have logs registered in your Matomo (Piwik) database? If your Matomo tracking code is properly installed, Matomo would record visits in your database. To check if you have logs in your database, go to Matomo > Visitors > Visits log, and select “today” in the calendar. If you see recent visitor information, it means that the visitor tracking is working, but maybe there is a problem with reports archiving. Note: you can also check if logs are recorded correctly by looking at the table “matomo_log_visit” (using phpMyAdmin for example) and see if there are visits recorded. Alternatively, you can enable the plugin “DBStats”, and then go to the “Database usage” tab in your Matomo administration area, and check if the table matomo_log_visit has any rows. Matomo (Piwik) displays a red cross (on IE) or a broken image icon on your tracked pages, instead of the 1*1 transparent Pixel Check out this FAQ answer. Access to piwik.php fails If your host uses mod_security to block requests containing URLs (eg. hosts like HostGator, The Planet), check out the Matomo (Piwik) and mod_security FAQ. If you use HTTP Authentication (Basic or Digest) on your Matomo files, you should exclude piwik.php and piwik.js from this authentication, or visitors on your website would be prompted with the authentication popup. Local copy of piwik.js outdated Some users make a local copy of piwik.js on a different server than their Matomo (Piwik) installation. This is not officially supported and causes issues when the piwik.js bundled with Matomo is updated and not compatible with the previous version (for example, this is the case in Matomo 0.5.5). Please check that your Matomo JS tracking code is exactly the one given in the Matomo admin screen. Using Matomo (Piwik) latest version If you are still seeing “No data”, please make sure you are using the latest version of Matomo (if not, update now). Check your webserver error logs If all else fails, it is possible that there is a server misconfiguration preventing Matomo (Piwik) from tracking your visits or processing reports. Often, there will be an error in the webserver error logs (apache logs, IIS logs, nginx logs, etc.). Please check that your PHP is configured to log errors: (php.ini should contain log_errors = On and error_log = /path/to/log). The messages in the webserver error log will help you find the source of the problem, for example search for the error message on this website. Are your pages tagged correctly? If you click on your website in a search result, and look at your page source, can you see the Matomo (Piwik) tracking code? Make sure the Matomo tracking code is installed on all the pages you want to track, and is not within an iframe. We advise to put the Matomo code just before the </body> tag. Are you using a redirect on your website landing page? If you are using a redirect, the visitor browser may lose the referer information. If you are tracking campaigns, and the landing page has a redirect, the URL loaded after the redirection will have lost the URL parameters. Make sure that your visitors arrive directly on the page with the Matomo (Piwik) tracking code installed. Matomo (Piwik) only records 1 referer by visit, which means that only the first referer used to access the website will be recorded. If you search for a keyword in a search engine, click on your website in the search engine results, and land on a page with the Matomo tracker, you may expect to see the keyword in your Matomo reports. However, if you visited your website less than 30 minutes ago, Matomo will recognize you as an known visitor on the website, will record your page view, but will not update your visit referer. Matomo only record the first referer of a visit. When testing Matomo and search engine detection, make sure you make the test more than 30 minutes after your last page view on your website. You’re using Safari, Chrome, or some other WebKit-based browser. There is a known WebKit bug (feature?) that interrupts the tracking request. One workaround is to add the target=”_blank” attribute to anchor elements. To improve Visitor Country detection, you should configure Geo Location in Matomo (Piwik) (click to learn more). If you want to improve the country detection accuracy in Matomo (Piwik), setup Geo Location now. By default, Matomo (Piwik) reports are processed when you request them in the User Interface. Please see How to setup auto archiving of your reports every hour? to automate the generation of Matomo reports. If you are using Matomo (Piwik) on a website (or thousands of websites) tracking millions of pages per day, please check out the doc: How Matomo for high traffic websites. If your server uses NFS-mounted storage (for example if you are using OVH mutu webhost), widgets might load very slowly even if you are not tracking a lot of data. This is because Matomo (Piwik) by default uses “file based sessions” which are very slow when using NFS storage. The solution is to change a setting to enable Database session storage. Such error or white page indicates that there is a problem on the server: check in your web server error log file for an error message. When you find an error message in your server error log, then search for this message in the Matomo (Piwik) FAQ. If you do not find the answer in a FAQ, maybe it is a bug in Matomo (Piwik). Search for the message in our issue tracker here. If you still have a problem and could not resolve it with those steps, please ask in the forums. When Matomo (Piwik) does not record your secure SSL traffic, you need to check that your Matomo server is correctly configured to be accessed over SSL / HTTPS. There could be a various number of reasons why Matomo (Piwik) numbers are different from your other web analytics solution. Concerning Google Analytics, several users compared Matomo (Piwik) and Google Analytics numbers, and found very similar statistics: on significant traffic, differences were always less than 5 percent. Conservative counting is definitely best – it makes your statistics more realistic on what you are trying to measure. Most analytics packages are used to measure relative upswings, we recommend using the same tool for all measurements and relative comparisons. See also the FAQ: Matomo (Piwik) tracks fewer visits than other web analytics tools, but tracks the same number of pageviews. When you upgrade Matomo (Piwik) to the latest version, it sometimes happen that Matomo stops working — especially when the User Interface is not working (blank white page, widgets not loading, error message, etc.). 3) Activate the display of PHP errors in your web server configuration. This may turn your white page into a useful error message page. 5) Reupload all Matomo (Piwik) files from the latest version. Sometimes, there are errors while uploading files and some of your Matomo files were maybe not overwritten by the latest version. Upload all files again, and check in your FTP software that the upload was successful. Also, check out the other FAQs in this “Troubleshooting” category, as there might be other solutions for your problem. If it still does not work, please search the Matomo (Piwik) Forums or search this website, and if there is no post about your problem, please create a new topic. For Matomo (Piwik) to work correctly, your web browser should be able to download from your Matomo server a set of HTML files. This FAQ explains what are various ways to configure your server to deliver Matomo HTML files. To test whether your server can serve HTML, visit this URL: demo.matomo.org/plugins/MultiSites/angularjs/dashboard/dashboard.directive.html (replace demo.matomo.org with your Matomo (Piwik) URL). If this HTML page on your server looks the same as this page then your server is configured properly to serve HTML files! if you are using Apache as webserver, put AddHandler text/html .html in the <directory> section of the Apache host config. Restart the webserver. if you are using the module Pagespeed in your server, please note that (pagespeed extension does not work with Matomo (Piwik)). You may disable pagespeed for Matomo by adding this to the apache config: ModPagespeedDisallow "path_to_piwik_here"
if you still have issues serving HTML files, verify that your server does not redirect requests from index.php to index or from index.php to /. Such redirects may cause loss of POST variables causing issues. If you have other suggestions to add to this list, please use the form in this page. Note: if you get the error message client denied by server configuration then you are experiencing this issue. You may follow the list of suggestions above to get it resolved. The GD library is not installed on your server. This library is required to produce the sparklines. Please ask your system administrator or your web host to install php5-gd for you. On linux, you can install php-gd by executing apt-get install php5-gd on debian type systems, then restart your webserver. If you are using Apache webserver and a module called mod_security, please disable this mod_security module as it may sometimes cause Sparklines graphs to not display. If after disabling all adblockers you still experience the issue, read on. Ask your webhost to increase the max_execution_time in your php.ini file, for example to 30 seconds. Then, delete your browser cache and refresh Matomo: after a few seconds, it should display correctly again! Matomo tracking, reporting, API do not require access to the Internet, for example if you are running in an Intranet or an infrastructure without any Internet connection. the Marketplace (installing new plugins and downloading latest versions of plugins and themes). When Internet is not available, usually these features will timeout after 10 seconds or so and display a warning/error message. Some examples of messages are: curl_exec: Connection timed out after 3000 milliseconds or curl_exec: couldn't connect to host or this error: Warning: file_get_contents (http://plugins.matomo.org/api/2.0/plugins) failed to open stream: HTTP request failed!. Follow the instructions below to fix this error. This is usually done on your Network or in the Firewall used, so please reach out to your technical team responsible for the network or servers. Alternatively you can disable all features that use Internet connections as described below. To completely disable all Internet-related features, please add the line enable_internet_features = 0 to the [General] section of your config/config.ini.php file. You can still download free plugins, as well as purchase premium plugins, directly on the Marketplace. After you download or purchase plugin(s) on the Marketplace, you can install them manually in your Matomo. If you are using a Matomo version before 3.6.0 or just want to disable the marketplace, you can do this by adding enable_marketplace = 0 to the [General] section of your config/config.ini.php file. On Intranet websites, often most users have the same IP address, and often the same browser and configuration settings. This causes Matomo (Piwik) to believe that most page views come from the same visitor. To fix this on Intranet websites, see this FAQ: Enabling Matomo on Intranet websites. When Matomo (Piwik) is showing a red cross image, or a broken image icon, it means that tracking visits is failing on your Matomo installation. It is not expected and should be investigated to fix the root of the problem as soon as possible (in the meantime, your visits are most likely not recorded). To see where the error comes from, open your website in Firefox, right click on the broken image icon, and click on “View Image”. This should redirect you to the URL “yourwebsite.com/piwik/piwik.php?…” and the error message should be showing. If the error message mentions MySQL, the error might come from a broken mysql instance or tables. Try to “repair” your MySQL tables (using phpMyAdmin for example). If the error mentions “failed to open stream: No such file or directory” this might be caused by missing Matomo (Piwik) files. Make sure all Matomo files are properly uploaded. For other errors, try to search on the search engine on Matomo.org. You can also try the Matomo support forums for more help. Unfortunately, Matomo (Piwik) is not compatible with the Apache web server module mod_security nor with CA SiteMinder. If your web host uses mod_security to block requests containing URLs (eg. hosts like HostGator, The Planet), you should contact your provider to have your Matomo application whitelisted and have mod_security disabled for Matomo. With mod_security (or CA SiteMinder) is enabled Matomo (Piwik) will look like it works but these security modules create major bugs in Matomo, including major data loss as requests are mistakenly discarded by the server! For more information, see this ticket on Matomo issue tracker. Some of the error messages you may see in Apache error log when using mod_security include client denied by server configuration:. When the other tool CA Siteminder is enabled, you may get: Due to the presence of characters known to be used in Cross Site Scripting attacks, access is forbidden. This web site does not allow Urls which might include embedded HTML tags.. In rare cases, Matomo (Piwik) will show “no data” for a subset of data, for example for one day, one week or one month, while other periods will work fine and report all data as expected. Firstly, if you are not using the latest Matomo (Piwik), please update Matomo to the latest version. Next, we will re-process the missing data. Please follow instructions in the FAQ How do I re-process my reports from the original raw logs?. Lastly, this is optional but we do recommend to setup auto archiving for your reports. Congratulations! you should have now restored the missing data and likely prevented this issue from occurring in the future. The Transitions Plugin gives you a report that shows the things your visitors did directly before and after viewing a certain page. There are few cases, where the data displayed in Transitions is slightly off compared to what you might expect. Since the pages report is pre-archived, it shows the numbers of time the archiving was launched. Transitions doesn’t use the archives but retrieves the number directly from the logs. So if you have more pageviews in Transitions and you are viewing a period that includes today, this might be why the numbers don’t match. The pages report sometimes aggregates multiple URLs into one row. For example when you track multiple domains, example1.org/home.html and example2.org/home.html will both end up in the row /home.html in the pages report. Transitions is based on unique URLs and will open on the URL with most pageviews that was aggregated into the row of the pages report. So if example1.org/home.html had more pageviews that example2.org/home.html, Transitions will open on the URL example1.org/home.html and show only statistics for this page. Before version 1.9, Matomo (Piwik) recorded URLs with the hash part (e.g. example.org/home.html#something) but didn’t show the hash part in the pages report. When you have tracked pages with different hash parts, the previous bullet point applies and you will see Transitions for the unique URL that had most pageviews of all the URLs aggregated into the row of the pages report you clicked on. Another case of odd numbers is when the sum of the groups on the left does not equal the total number of pageviews. If you think that this is the case, first make sure that you have included the page reloads in your calculation. If the numbers still don’t match, read on. This can happen when there were downloads or outlinks tracked directly before views of the page in the center. We could have added a group on the left “From Downloads” and “From Outlinks” but we decided not to, as it would make the interface more complex unnecessarily. Since we didn’t want to add the missing pageviews to any of the other numbers, the sum of all groups that are shown might differ from the total number of pageviews. The main limitation of Transitions is that it only works on the period of time you still have the logs for. If you have set up Matomo (Piwik) to delete old logs, the pages report will still contain data from before because the reports were archived. Since Transitions reads its data directly from the logs it can only work if you still have the logs. Another reason for an apparent case of incomplete data, is connected to the truncation of reports. Matomo (Piwik) doesn’t necessarily report every unique URL on your website, but instead there is a limit for the maximum number of rows in the pages report (which can be changed). Usually that’s not a problem because the number is high and if you haven’t heard about it yet, it probably doesn’t apply to you. But if this happens on your data, there might the case that for some days of a period, the page is listed under Others but not for other days. The report for the period is the sum of the daily reports and therefore it can happen, that a URL is “missing” on some days and not on others. The sum of the pageviews will be too low in the actions report but Transitions reports the number of pageviews correctly. It can do so because it doesn’t use the archives but the logs. We hope you enjoy the Transitions feature. We appreciate if you let us know what you think about it! If your website has HTTPS / SSL pages, to ensure that all your visitors actions will be tracked on all browsers, you need to check that your SSL Server is correctly configured. We recommend to take the SSL Server test, for the URL of your SSL Matomo (Piwik) server. In particular you should check that “Chain issues” is “None”, otherwise some browsers (for example on Mobile devices) will not connect to your Matomo SSL Server and you will lose some visitor tracking data. 1) Delete the Tracking Logs and / or…. You can configure Matomo (Piwik) to automatically delete your older tracking logs from the database. Deleting old logs has many advantages: 1) it will free significant database space, 2) which will slightly increase performance, 3) for Privacy reasons, it is sometimes recommended to keep detailed logs only for 6 months or so, and remove older data. To configure Log delete in Matomo (Piwik), login as the Super User, click on Administration > Privacy > Anonymize Data > Delete old visitor logs. You can then configure to Delete logs older than N days, and execute the log purging every day, every week or every month. When ‘Delete old logs’ is enabled, only the raw logs of activity will be deleted from the database. Specifically, only the Mysql tables starting with matomo_log_* are affected. Important: When you enable automatic log deletion, you must ensure that all previous daily reports have been processed, so that no data is lost. See this FAQ for more information. Deleted data: All deleted data is lost forever. Transitions report: The Transitions report is processed in real time, using the logs. When deleting old log data, the report will display transitions only for the days that still have log data. Unique visitors metrics: The Unique visitors metrics for Weeks, Months, Years will be available only for those date ranges that still have log data. If you have properly setup the auto archiving script (see important note), you will still access all historical reports (even when logs are deleted). You can also delete old logs data by using a console command. Read this FAQ for more information: How do I delete old visitors statistics for a given website and/or date? If your Mysql database space is limited, you can also Delete old reports in Matomo (Piwik) > Administration > Privacy. You can choose to keep daily, weekly, monthly and / or yearly data. We recommend keeping monthly and yearly data as an interesting dataset. If you enable any of the 2 features to delete old data, the Database estimate size will refresh and give you an idea how much space you would save using the feature. If you cannot wait for the next automatic tasks schedule, you can also force the purge by clicking on ‘Purge Now’. When you automatically import your existing userbase in Matomo (Piwik) using the UsersManager API, you might want to disable the check of minimum length and valid characters for the User’s login and password. In particular, Matomo requires a password at least 6 characters long, and a login string that must contain only valid characters (ie. letters, @, etc.). Your firewall may be blocking outbound HTTP requests. If you have a HTTP proxy (e.g., squid), you can configure the forward proxy as follows. Once configured, Matomo (Piwik) will contact external hostnames using this proxy server. Unfortunately, Segmentation fault Matomo (Piwik) errors mean that the lower level software has crashed in some unexpected fashion. In this case, most likely PHP or some of its specific modules (PDO, mysqli, etc.). It is possible to overcome this issue by updating these softwares. upgrade PDO (and/or mysqli) to the latest version. if you still get the error, try disabling extensions such as eAccelerator, xcache and/or Suhosin, if you are using one of them. if you still get the segmentation fault error at this point, try the suggestion in this issue (if it works for you, please post a comment in this issue). You should now have a working Matomo (Piwik) instance that does not crash, congratulations. This error message means that PHP couldn’t include a file that Matomo (Piwik) requires. Please make sure all Matomo files are correctly uploaded on your server. You can reupload the missing files by looking at the error message, or reupload all Matomo files and try again: this should work! If you get this error, this means that the PHP running on your webserver is too old. Please ask your webhost or sysadmin to upgrade your PHP to the latest PHP version: see Matomo (Piwik) requirements for further details. If you have trouble running Matomo (Piwik), consider using one of our Official Matomo Hosting solutions. When Matomo (Piwik) displays an error message An error occurred: Cannot connect to the database this means that Matomo was not able to connect to your Mysql database. If your Mysql server is up and running, maybe the username or password used to connect has changed? To update the Mysql connection information, edit your configuration file config/config.ini.php to view and edit your connection details.
. If you are on a shared web hosting, we recommend contacting your web host and ask them to investigate why it fails to connect to the Mysql server. This error happens in very rare cases where, for some unknown reasons, the data was not properly recorded in the database. In Matomo (Piwik), all reports data is compressed (gzip) and then stored in the tables piwik_archive_*. You can find “piwik_archive_blob_2009_05”. Please delete this table in your Matomo (Piwik) database. Matomo will process it again next time you are viewing reports. This will fix the issue. This will affect all emails sent from Matomo: Password reminder, Email reports. You can also change the default email address “From:” in PDF reports emails. You must increase PHP memory limit. See this page for more info. This will ensure that Matomo (Piwik) always has enough time to process your analytics reports. Server timed out and closed the connection. To fix, check that wait_timeout mysql variable in your my.cnf configuration file is large enough. You may also need to increase the innodb_log_file_size mysql variable in your my.cnf configuration to for example 128MB or higher. The MySQL server error “Warning – Error while sending QUERY packet” has two main causes and solutions. Please check this FAQ for the solution. To display unicode characters in the Static image graphs, please see this FAQ. If you’re not using a reverse proxy, but using https with a web server that doesn’t set the HTTPS environment variable, you can either set assume_secure_protocol=1 or reconfigure your web server. For example, lighttpd should be configured with setenv.add-environment = ( "HTTPS" => "on" ). Similarly, nginx users should use something like fastcgi_param HTTPS on;. When you get an error message similar to Warning: Unexpected character in input: '\' (ASCII=92) state=1 this means that your PHP version is not high enough. See this FAQ for more information. Most of the time this warning is displayed, just after you have just migrated Matomo (Piwik) to a new URL or server, and the new hostname you use will not be the same as the stored one. In this case, ask your Matomo Administrator to update the Matomo Hostname in Settings > General Settings. (for geeks only) How does this message improve security? This warning is a security feature Matomo (Piwik) provides to make Matomo more robust and prevent the so-called “Host Injection” vulnerability. Attackers could try to send fake hostnames to Matomo in an attempt to get users to reset their password through an attacker’s server. If users do that, the attacker could gain access to Matomo. Matomo protects against this type of attack by storing a list of trusted hostnames and checking if the ‘Host’ HTTP header in any request is in this list. If it doesn’t match, we show you a warning. 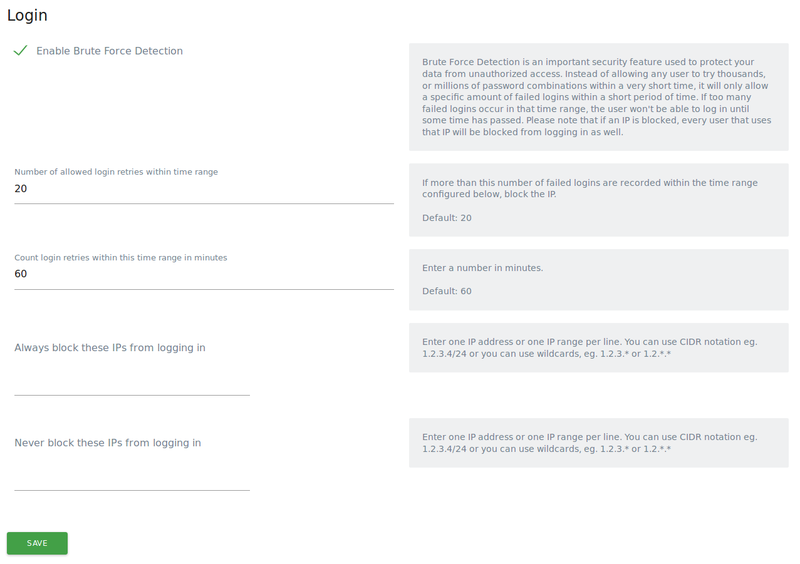 This feature was developed as a “Security Best Practise”, following a suggestion by a security researcher working with Matomo (Piwik) through our Security Research program. By default, for security reasons, Matomo (Piwik) prevents standard pages and reports to be included in an iframe. If you try to include Matomo pages as Iframe you will likely get the error Refused to display ‘https://example.com/’ in a frame because it set ‘X-Frame-Options’ to ‘deny’..
To solve this issue, and let you include Matomo Analytics widgets in your website or app, we recommend you use the standard “Widgets” mechanism. See also: How do I enable users to login into Matomo (Piwik) inside an iframe? When you get the error Table matomo_log_visit is marked as crashed and last (automatic?) repair failed. it means that the Mysql tables got partially corrupt and must be repaired. This problem may occur for various reasons (such as missing space on the disk) but it should occur very rarely. Your tables should now be repaired and Matomo (Piwik) up and running! When you use Matomo (Piwik) and view the information displayed in any report, there are options you can use to configure how the data is displayed. For example you may change: the number of rows displayed in the report, the column being sorted, the visualisation being used (table, graph, treemap, etc. ), etc. When a user changes one of these settings in any report, these settings are saved by Matomo so that the next time the user views this report, the report will be displayed as it was last configured by the user. In some rare cases, you may want to reset these stored settings so that all of Matomo (Piwik) reports will be displayed with the default settings. For example, this is useful when the Visitor Log or Segmented Visitor Log fails to load for a user, often because the user had selected ‘all’ in the bottom-right dropdown, which may create performance issues on high traffic websites when Matomo tries to load thousands of visits in the log. After making the change, Matomo (Piwik) will track up to 2048 characters in your Page URLs and Page Titles. You may adjust the value appropriately for your use case. There are a few possibilities with regards to debug logging in Matomo (Piwik). The Monolog Plugin must be activated in your Matomo (Piwik) server, you can check it by going to Administration > Plugins. Once you have enabled logging, you can easily view & search the logs by using our LogViewer plugin: learn more in How do I view Matomo (Piwik) application logs? Matomo (Piwik) will then output all SQL queries, group them by unique query, and show the total time spent as well as average time spent on each query. This issue is generally caused by missing files in your piwik directory. To fix this issue, please reupload all files from the latest Matomo (Piwik) version to your server. If after re-uploading all the files from the latest version you still experience this issue, try to restart the web server. If you still have the issue after doing those two steps, it may be a bug in Matomo (Piwik). Please create a bug report. To solve this error, you need to install the OpenSSL package for PHP on your webserver. On a FreeBSD server, you may need to install the following package: php53_openssl and restart your webserver. and restart the webserver. The error should be resolved. Note: Matomo (Piwik) will never OPTIMIZE table which are Innodb, we will only OPTIMIZE tables of the Myisam type. Matomo (Piwik) processes huge amount of data and then stores this data in the database. For improved performance, Matomo tries to import a lot of data in the database at once using a Mysql feature called “LOAD DATA INFILE”. You can check whether your server supports this performance improvement in Administration > System Check menu. The system checks two commands: LOAD DATA INFILE and LOAD DATA LOCAL INFILE. It’s enough if either one of these work. give the process mysqld executable-access (+x) to files in path/to/piwik/tmp/assets/* and all parent folders. check in your config/config.ini.php that you do not have enable_load_data_infile=0. If you see this line in the file, delete it. and/or disable in your php configuration php.ini the options open_basedir and safe_mode. Restart webserver. When you’re getting the message “General error: 3 Error writing file /tmp/xyz” while using Matomo Analytics, the reason is that the disk space is full on your /tmp partition. The MySQL/MariaDB database is trying to create new files in the folder /tmp but the disk space is full, so we recommend to increase the size of the /tmp partition (or another path may be used as configured in your MySQL setting tmpdir). Once you’ve increased the disk space of your tmp directory, your Matomo page should then load successfully. If you get the following error: Fatal error: Maximum function nesting level of '100' reached, aborting! in core:archive console output or in the Matomo (Piwik) UI, you can solve this problem by editing the Xdebug PHP extension settings in php.ini or xdebug.ini and add the following: xdebug.max_nesting_level=500. After making the change, restart your web server. If you are upgrading from an old Matomo (Piwik) version (pre Matomo 2.1.0), you may be still using Myisam tables and getting errors such as “Waiting for table level lock”. Such errors are occuring because your tables are not yet in InnoDB engine. You can convert your tables by using a specific SQL command. Note that the conversion of your big tables from Myisam to InnoDB will take some time and require a lot of RAM and space in the /tmp partition. Running this SQL query will generate a SQL ALTER statement which you can then execute to convert all your Matomo (Piwik) database tables from Myisam into InnoDB. Copy paste the output of this SQL query and run this in your Matomo (Piwik) database and all your tables will be upgraded to InnoDB. If your database is large, you may want first to temporarily enable the maintenance mode. If you get the error PHP Fatal error: Call to undefined function Matomo\\Plugins\\CoreAdminHome\\imagecreatefrompng() it means that you need to install the GD extension for PHP. The GD extension is required for Matomo (Piwik) to generate report graphs, generate sparklines graphs, as well as to upload a custom logo. To check whether the GD extension is installed on your server, go to Matomo > Administration > System Check. When you are getting the message You are currently not allowed to log in because you had too many failed logins, try again later. it is because the Matomo brute force detection was triggered. You can workaround this issue by whitelisting your IP address in Matomo > Admin > General Settings > Login, under the setting called “Never block these IPs from logging in”. If you enter your IP address in this field and then click Save, this will disable the brute force detector feature, and you shouldn’t get the error message “you are currently not allowed to log in” anymore. If you think you have found a bug, please read our guide on how to submit a bug report. We appreciate if you take the time to report bugs that you experience with Matomo (Piwik). With your help, we will build the most reliable analytics platform! Learn more about our Quality Assurance efforts.